Yip. Since its kinda my Friday ( I worked the last 4 nights and work the next 3 after tonight) AND the snow is just sooo depressing, we decided to get take out, and pizza would just not do. 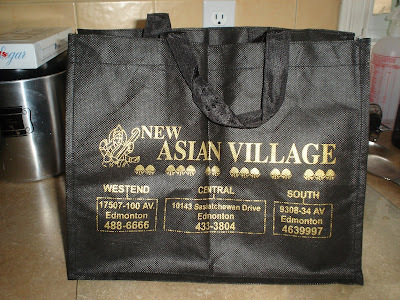 We ordered our favorites from the New Asian, which now have these nifty reuseable bags, and Mike went to get it from the new northside location! Yes, we are pretty excited about that. The pakoras were fantastic, and the biryani excellent, but to be honest, we have found a brand of butter chicken that Safeway carries that tastes literally the same, and costs much less to make! We taste tested tonight to make sure, and yip, homemade is the same. So we can try out a new dish next time. But now I am scared that Safeway will stop carrying the brand of butter chicken sauce....perhaps a little stockpiling is in order LOL! That reminds me! I have a wine kit ready to go, I just need the equipment! I bought it at Christmas with the full intention of starting the Chardonnay that my parents first tried (oooh, its far too good) but I need the actual tub and stuff to make it in. Someone remind me when I am in Airdrie to pop to the Home Vinter, ok? And that's about it...hope everyone is surviving this crapola weather we are getting. Hubby isn't fond of Indian at all, so I just hear stories of how wonderful New Asian Village is, and have to order pizza. ha, after ACT on Friday I went to Khazana's with DH for lunch and it was one of the best meals there ever for me. Everything was just a tiny bit spicier than usual and they had lots of my favourites, along with a tasty new one I hadn't tried. yum yum yum. LOVE Indian food - yum! You reminded me I bought DH a wine making kit for Xmas - I have to remind him to get going with it! It's a Riesling. We've never made wine before so I hope its easy!!!! wine's not too hard to make, we've made plenty, it's the waiting for it to age which is the hard part. i didn't take kaeli to school today because of the driving. sean suggested we not drive yesterday or today so we did things at home and then she went to the sitters the same time as regan.